Thyroid autoimmunity can cause several forms of thyroiditis & may lead to hypo or hyperthyroidism. Suseptibility of autoimmune thyroid disorders (like any other,, diseases) is determined by genetic & environmental factors. Causal factor for stress in the autoimmune process is not clearly established. Viral thyroiditis does not lead to autoimmune thyroid disorders. 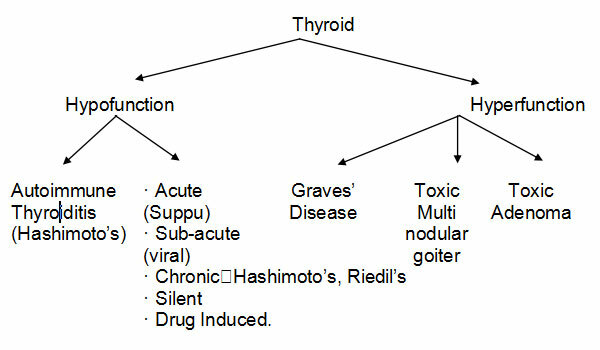 Thyrotoxicosis of Grave’s disease is caused by antibodies which bind to TSH receptors, mimicking its action. In some cases TSH receptor - antibodies can block or stimulate the receptors, leading to oscillation between hypo & hyper thyroidism, in such cases close supervision is a must. Antibodies to TPO and TG are readily measured in case of Hypothyroidism. Level of 🡩 TSH upto 10 with Normal free T4 is due to compensation by normal cells, called sub-clinical Hypothyroidism. (May be goiterous). Level of 🡩 TSH > 10 with low level of free T4 is called Clinical or overt Hypothyroidism. Later stage of the disease, may lead to atrophic thyroiditis. Grave’s disease of thyro toxicosis accounts for 60 to 80 % of hyperthyroidism. Other causes of hyperthyroidism are toxic multinodular goiter, toxic adenoma. 1) Acute thyroiditis - is rare, but when present in children or young abult presents WITH PAIN IN THYROID, fever, DYSPHAGIA. It may become suppurative. 2) Sub-acute thyroiditis - This is also called a Viral / granulomatous / deQuervein’s Thyroidits. The virus can be of mumps, coxachi, influenza, adeno, echoviruses. The diagnosis is offen missed as - pharyngitis. Age commonly between 30 to 50 yrs., women affected more. The thyroid gland shows patchy infiltration leading to granuloma, later on fibrosis. Finally thyroid returns to normal, usually several months atter onset. So initially due to follicular destruction, there is release of TG & T4 leading to 🡩 T3 T4 & Low TSH. During destructive phase T3 T4 levels drop with 🡩 TSH levels. Finally all levels come to normal. Diagnosis is done in 3 phases. 1] Thyrotoxic phase, 2] Hypothyroid phase 3] Recovery phase. Large doses of Aspirin 600 mg - every 4/6 hrly, may be prednisolone required 40 - 60 mg, Antithyroid medicines are not required, T4 supplementation may be required in prolonged 2nd stage, but in low doeses for natural recovery. 3) Chronic Thyroiditis - The most common form of chronic Thyroiditis is Hashirnoto1 5 autoimmune Thuroiditis - often presents as, firm - hard goiter of variable size. Riedel’s thyroiditis is a rare condition, occurring in women (middle aged) with insidious painless goiter causing pressure symtoms, on trachea, oesophagus, recurrent laryngeal nerve, neck veins. Thyroid dysfunction is uncommon. Diagnosis is done by FNAC. Surgical excision is required to relieve pressure symtoms. 4) Silent Thyroiditis - Also painless thyroiditis, offen occurs post - partum - 3-6 mts. after delivery. It has a course like sub-acute thyroiditis & occurs in patients, with underlying authoimmune thyroid disease. Typically a phase of thyrotoxicosis for 2-4 wks, then a phase of hypothyroidism for 4-12 Wks, followed by resolution. To distinguish from Subacute Thyroiditis, the ESR is N & TPO A is 🡩. For transient treatment thyrotoxicosis, symptomatic Propranolol - 20-40 mg 3 to 4 times daily, for transient hypostage, T4 may be given in small (50 mcg) doses, but should be -withdrawan & monitored. 5) Durg induced Thyroiditis - Many drugs used for malignancies and chronic hepatitis B or C can lead to thyrioiditis. 3 factors alter thyroid function in pregnancy. 1) Transient increase in hcg during first Trimester, which stimulates the TSH receptors. This may induce transint hyper thyroidism, but resolves in middle of pregnancy. 2) Esterogen induced rise in TBG during 1st Trimester, which is surtained during pregnancy.This will induce decrease in level of free T3 T4 =- L Hypoth. State. 3) Increased Urinary iodide excretion which can cause impared thyroid hormone synthesis, in the areas of marginal iodine sufficiency. Dietary deficiency will enhance / induce hypothy. Status L supplementation of Iodine is a must. Thyroid is an endocrine gland, situated on trachea (windpipe) in the shape of a butterfly. It is richly supplied by blood. There are four parathyroid glands at the posterior (back) surface of thyroid gland. Thyroid gland secretes two hormones, T3 – Tri – ido – thyronine & T4 –Thyroxine- Iodine is required for their synthesis. Their secretion is stimulated by Pitutary gland by TSH – Thyroid stimulating hormone. Pitutary is stimulated by hypothalamus by TRH – Thyroid Releasing Hormone. This hypothalamo – pituitary – thyroid axis does have a circadian rhythm. TSH acts on thyroid cells by combining with receptor. TSH increases the secretion of T3 & T4 by various ways & its release within 30 min. Disturbed psychological status like anxiety and excitement may affect thyroid function by altering the secretion of TRH & TSH. This effect is mediated by hypothalamus. Commonly seen thyroid disorders in society are Autoimmune thyroid disorders. They may present clinically, as hypo – or hyper thyroid status. Role of stress in autoimmune process is not clearly established. Hence role of Yoga as a Theraputic modality in Thyroid disorders, can not be explained, however the Yogic discipline will minimize anxiety & excitement (by practice of equanimity) helping hypothalamic dysfunction.